Recently someone asked me if I believed in sovereignty. I whispered back, “Of course.” That person then went on with their life assuming I believe the same things about sovereignty that they do. I let them go because it was not an appropriate time to chase the point, but I am pretty sure they did not understand my answer. Many people have a one sided view of sovereignty. For some this is little more than name calling. If you do not accept their views then you are assigned to class or category somewhere in between dogs and Pelagius. For others it is simply a matter of not thinking through the possibilities of how sovereignty plays out. I believe God is the Creator and Ruler of the universe. This is a statement of sovereignty, but it is a very broad statement. Working into the specifics I want to ask more questions. Does sovereignty mean merely authority over an area, or by necessity does it mean making every decision within that area? Does God have the right to delegate? An earthly king is said to be sovereign. However somewhere in the kingdom there is someone doing something the king disapproves of, for this example let’s name a pickpocket. This fact does not detract from the king’s authority. He is still sovereign, despite the fact he doesn’t have control over every event in the kingdom. In fact, he doesn’t even know what all is happening in his kingdom. If he did he would stop it. This example does not carry well to Deity because God knows everything and can do anything. God is omniscient and omnipotent. Many people get hung up when trying to imagine how omnipotence and omniscience working together, affect sovereignty. Some have supposed this means God ultimately makes every decision. This description is unpalatable because it makes God responsible for sin. I have no doubt God knows everything about sin, but I don’t believe He initiated sin. So in God’s kingdom, which includes everything, there are pickpockets. We can agree He knows. We can agree He knew in advance there would be. But does that leave us with only two choices either God made the choice for the pickpocket to engage in this activity or God is not sovereign? No, I don’t believe either of these choices. I believe God is big enough to create moral agency. Moral agency means we make and bear responsibility for our own moral choices. For many people moral agency is oxymoronic. They believe that since God made us, He is ultimately responsible for our choices. But this is a denial of the meaning of moral agency. Moral agency, once again, is our making and bearing responsibility for our own moral choices. Just because we have a hard time wrapping our head around a concept doesn’t mean God cannot do it. Shortcutting the definition to make God responsible, is equivalent to claiming He is not big enough to make creations with true moral agency. I think He is capable of doing so, and did. This choice did not detract from His sovereignty, it came as His decision as to how to express His sovereignty. Normally on Tuesdays I would put up a picture of a bird and a devotion based on the characteristics of that bird. Unfortunately I am running out of bird pictures, therefore I have given you something different today. The two pictures above are a butterfly. They are the same butterfly. This is a comma, probably a satyr comma. 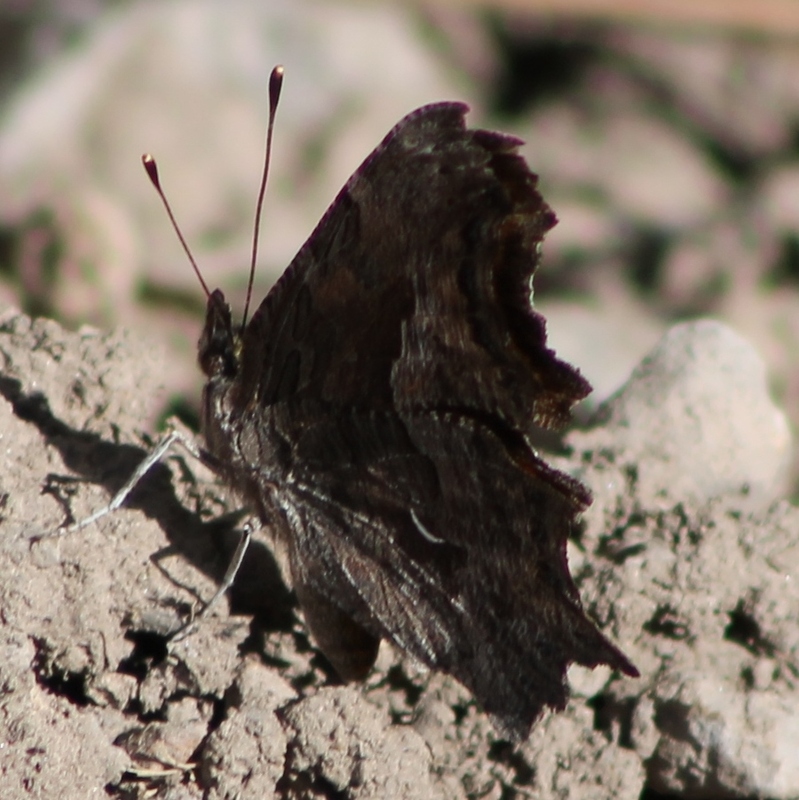 I am still relatively inexperienced at identifying butterflies so I am not confident in the exact species, but it is undoubtedly a comma. These butterflies have the ability to look like a leaf when their wings are closed. And they keep their wings closed almost all the time. But the top of the wing, the view you get when they open their wing is a bright, almost metallic orange. 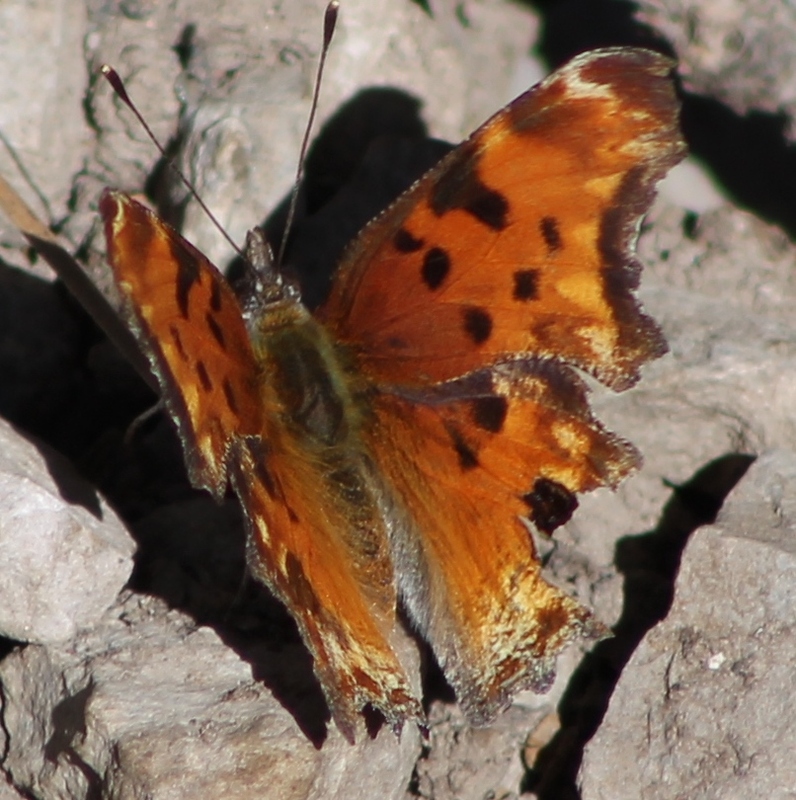 It is a spectacular sight to come across a comma with its wings open, but it is their habit to leave their wings closed. They do this for safety, since when their wings are closed they can be very hard to pick out among the detritus on the forest floor. By being hard to see they are highly unlikely to be eaten. The differences between the two views can be very dramatic when the bug flies. It will hold its wings open and glide, looking like an orange reflector floating through the trees. Or it will flap as it moves looking a bit like a flittering, blinking signal light. But in both cases when it lands the bright orange flips off and it seems to disappear. Sometimes Christians can be like this. They will show themselves to the world in a bright attractive way, but their inconsistency in Christian living is like turning off the light. They can appear strong and exemplify the benefits of righteous choices, and the light is bright and attractive to a lost world searching for answers. Then they can tell an off color joke or let out a swear word and the light blinks off. Perhaps more often than the light blinks off because they brushed up against immorality, the light blinks off because the Christian felt the need to keep their spirituality low key. Just like the butterfly fears being eaten, many Christians fear attracting the attention of those hostile to Christianity. The devil has convinced too many people it is impolite to talk about Jesus, and we will become subject to some horrible persecution if we live our beliefs out publicly. We make a foundational mistake when we listen to this kind of propaganda. The mistake is listening to the wrong person. Satan may tell us to keep our light to ourselves, but Jesus tells us just the opposite.